Juniper Networks is a fast growing IT company with offices around the world. The workforce is international, young and highly educated. The business environment in which the company operates is highly competitive. All elements of a working day contribute to letting employees enjoy their workspace. The old food space was outdated and inflexible to serve the needs of the guests. Create a workplace with a buzz, a multifunctional space where food, leisure, work and meetings mix. 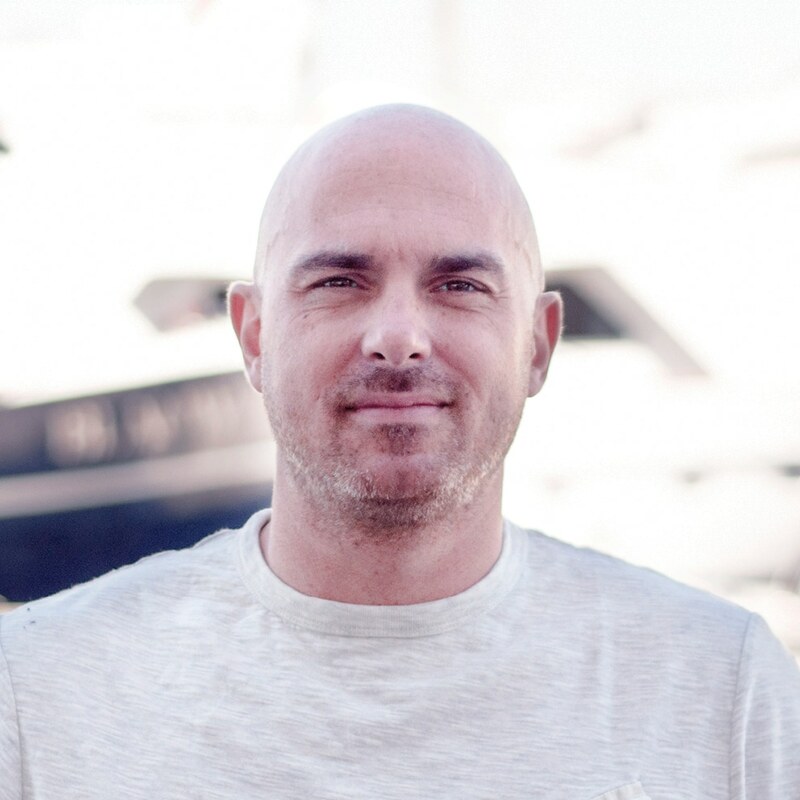 Concept design, interieur design, food concept, businessmodel consultancy. Enbiun designed floor plans, technical lay out, materialisation, assortment and service area. The interior was developed together with Platform group ltd. Besides the design, enbiun was the project consultant for the businessmodel specifications and requirements for the new catering contract. We advised Cushman and Wakefield on these subjects. 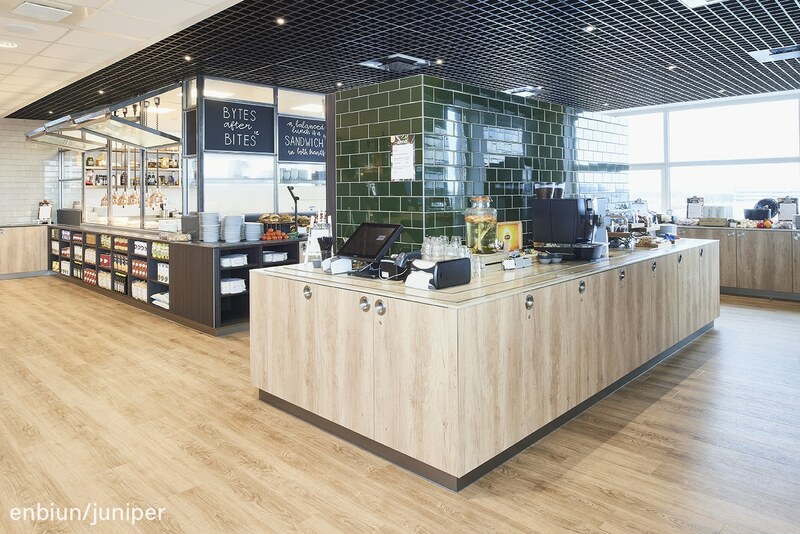 Junipers foodconcept is an essential component for creating a lively place with social activity. As a main driver for the concept we created an open kitchen. 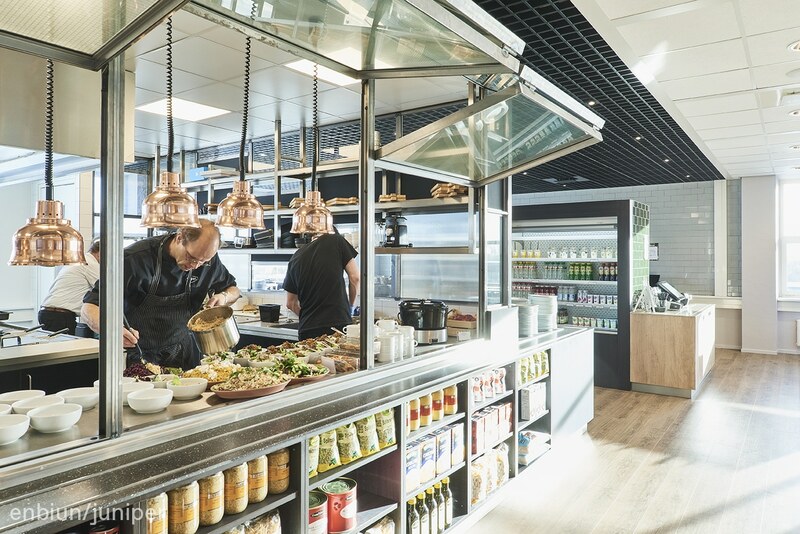 This open kitchen provides the guests with on the spot created hot meals, great salads and to-go meals. Opening up the kitchen creates a constant display of activity and sense of freshness. 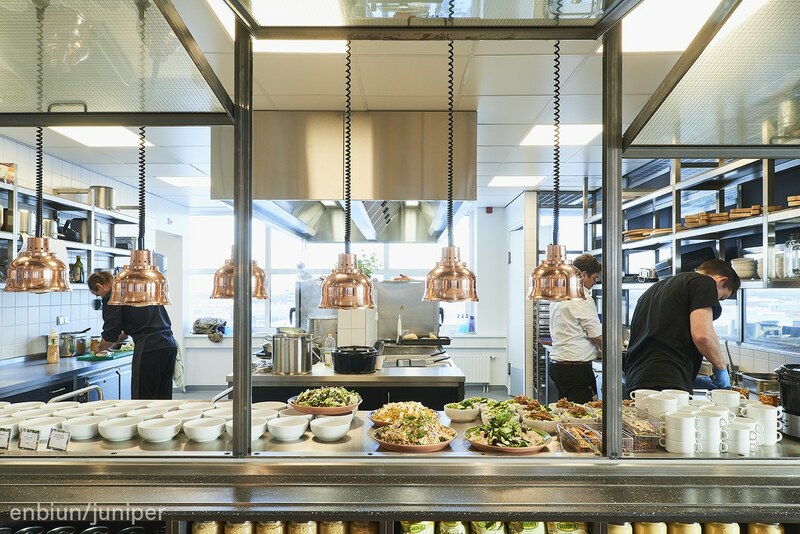 The open kitchen also has the identity of a restaurant kitchen, instead of the dull catering kitchens you would usually find. 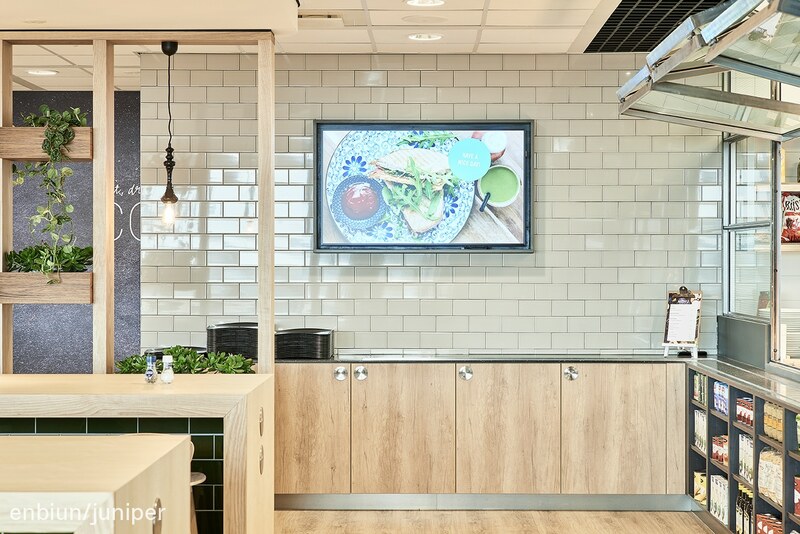 Additionally there are prominent to-go fridges which are branded by Juniper's kitchen, creating a link with fresh preparation and convenience. The kitchen is designed with use of materials that are archetypical and functional for a restaurant kitchen. 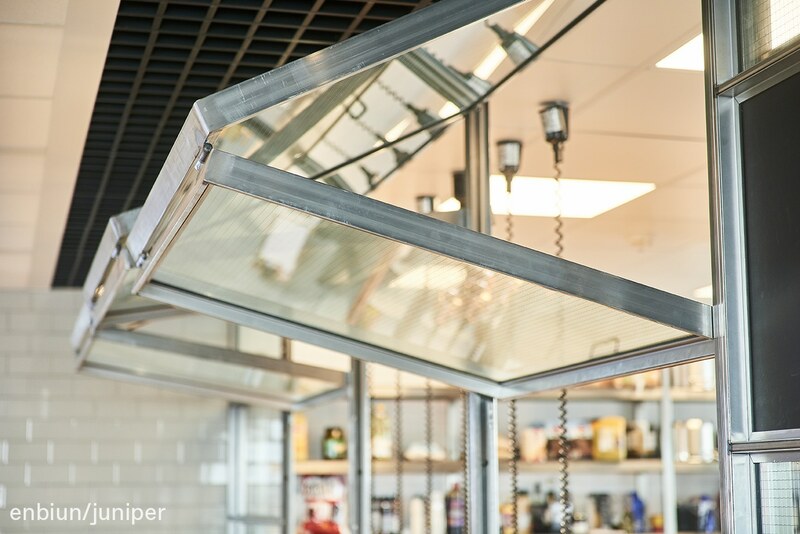 The open cooking area is surrounded by a framework of steel. 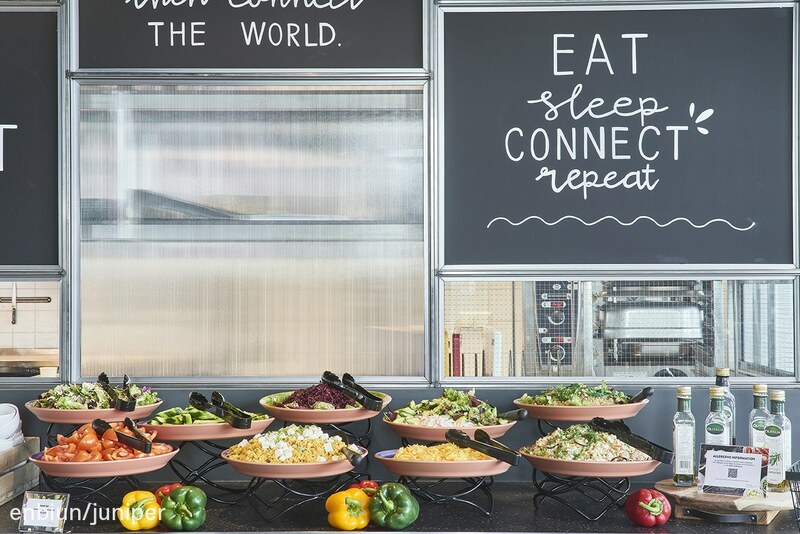 This is filled with different types of glass (safety glass, ribbed glass and transparent generic glass) and chalkboard sections in order to communicate the daily menu. Sections of the kitchen can be opened with sliding panels, emphasizing the dynamic international street food appeal. The fridge and self pay island are green in the same family of materials. Different types of composite materials are used for the countertops, green metro tiles as walls and dark green wood for cabinet cladding. For the to-go fridges we specifically chose a darker color, interior and exterior, to make colourful products pop. Dark surfaces also give this a more ‘retail’ feel. For the contrast storage cabinets are made from grey/light oak wood with black steel shelving details. Essential to the concept is the fresh and mostly healthy dishes that are prepared in the spotlight, front cooking in an open kitchen. Guests experience the homemade feeling of a well organised kitchen that has a passion for food and Cooking. The assortment is based on recognisable international style dishes made from fresh ingredients. A limited choice in mains but high quality assortment with great variety through toppings. Iconic dishes are the hot meals and the great saladbar. It has a daily and weekly changing menu with 80% homemade items. 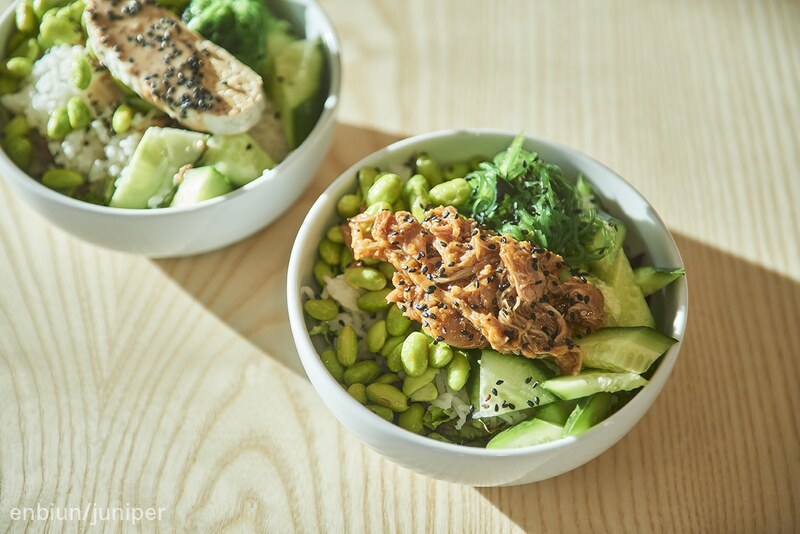 The smart menu cycle uses components from meals throughout the week to realise an optimal no-waste result. 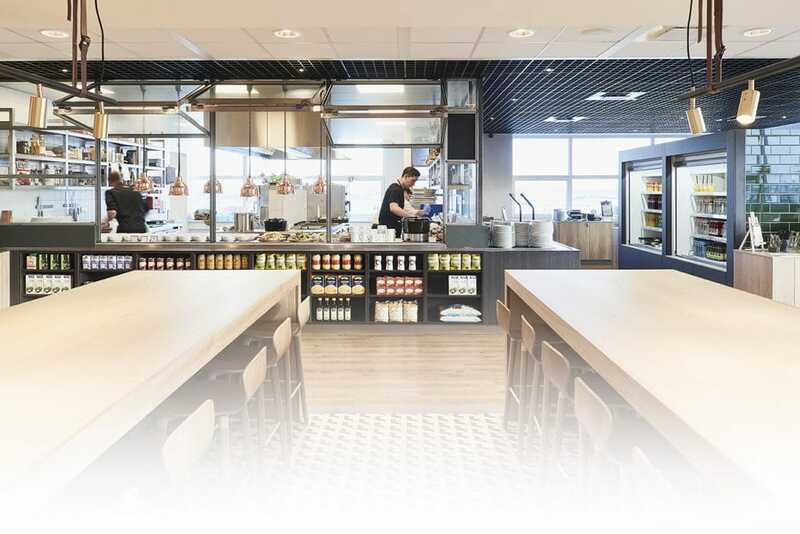 Besides the design services, enbiun had a role as consultant for the businessmodel specifications and requirements for the new catering contract. Juniper finalised this proces with choosing Appèl Catering as her new caterer. The company now operates the full restaurant area. The restaurant opened her doors in October 2017 and welcomes about 150 guests a day. Company catering, preparation, service, dishwashing, office, leisure, seating area, meetings, presentations, informal get togethers. Opening hours 8-17: Breakfast, Lunch, Diner, To Go. Transparant and open, internationale vibe.